Grew Up… in his momma’s swamp house in Louisiana. Bobby’s father (according to the story his momma tells) died of dehydration in the Sahara desert while working for the U.S. Peace Corps. This story drove Bobby to dedicate himself to the cause of hydration. 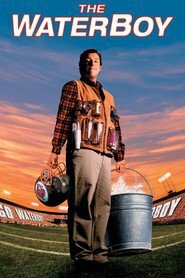 Profession… waterboy for the University of Louisiana Cougars football team. Bobby, despite his dedication to the team, is consistently made the object of cruel jokes by the players and coach. As a result, he develops severe anger issues. Interests… water. Bobby just has an innocent desire to keep the football players hydrated, but Coach Red Beaulieu fires him for “disrupting” the team’s practices. Bobby finds himself adrift until Coach Klein of South Central Louisiana State University discovers his talent for tackling. Personality… innocent, slow, and inarticulate. Bobby’s slight mental handicap has always made him an outsider. As his mother puts it, he doesn’t have “the social skills.” He may stutter incoherently most of the time, but he knows what he is passionate about and won’t let his overbearing (but well-meaning) mother stop him from playing football. Bobby Boucher Jr.'s popularity ranking on CharacTour is #3979 out of 5,000+ characters. See our top-ranked characters and read their profiles.